The wine of Olivier Ravoire is relatively recent. The wines came about after Roger Ravoire created their negociant firm in 1987. Their negociant company was named Cellier Val Durance. The next step came about in 2004 when the son of Roger Ravoire joined the company, Olivier Ravoire. Once Olvier joined the company full time, they changed the name of the firm to Rovoir & Fils. 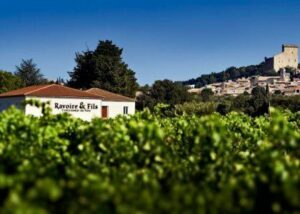 Ravoier & Fils produce a wide range of wines from not only the Chateauneuf du Pape appellation, but they also make wine in Gigondas, Vacqueyras, Violes and the Cotes du Rhone appellation in the southern Rhone Valley. In the Northern Rhone Valley, they produce and sell wines from Cote Rotie and Crozes Hermitage. In Chateauneuf du Pape, Olivier Ravoire produces a red Chateauneuf du Pape wine and 1 Chateauneuf du Pape Blanc. Olivier Ravoire Chateauneuf du Pape Rouge is produced from a blend of 80% Grenache, 10% Mourvedre, 8% Syrah and 2% Cinsault. The wine is aged in used French oak barrels. Olivier Ravoire Chateauneuf du Pape Blanc is made from a blend of Grenache Blanc, Clairette and Bourboulenc. Olivier Ravoire can be enjoyed on the young side. Young vintages can be popped and poured, or decanted for about 1 hour, give or take. This allows the wine to soften and open its perfume. Older vintages might need very little decanting, just enough to remove the sediment. Olivier Ravoire is usually better with 2-4 years of bottle age. Of course that can vary slightly, depending on the vintage. In the best vintages the wine should be consumed within 3-10 years after the vintage. Olivier Ravoire is best served at 15.5 degrees Celsius, 60 degrees Fahrenheit. The cool, almost cellar temperature gives the wine more freshness and lift. Olivier Ravoire is best served with all types of classic meat dishes, veal, pork, beef, lamb, duck, game, roast chicken, roasted, braised, stewed, barbecue and grilled meat dishes, sausage and cassoulet. Olivier Ravoire is also good with Asian dishes, hearty fish courses like tuna, mushrooms, cheese, pasta, eggplant and tomatoes. The white wine of Olivier Ravoire is best served with a myriad of different seafood dishes, shellfish, crab, lobster, sushi, sashimi, chicken, pork and veal, as well as Asian cuisine. With an interesting citrus note to the ripe, sensually textured red fruits, the wine is loaded with soft, juicy, ripe, spiced black raspberries, cherries and enough, chalky tannins to allow for aging and evolution. With a nose of florals, kirsch and spice, the wine is medium bodied, soft and polished, with a peppery, fleshy, cherry note that kicks in with the finish. This should be charming on release. The wine was produced from blending 80% Grenache with 20% Syrah. Medium bodied, fresh, soft and polished, with an elegant, charm and loads of sweet, ripe, peppery cherries, kirsch and strawberry that are already showing their character. Oak, licorice and waxy red fruits combine to produce a soft, easy drinking, medium bodied wine with a kirsch finish. Medium bodied early drinking wine with an herbaceous, cherry center.